It’s no secret that Captain America 3 has been a hot topic among the geek community for weeks now. Multiple publications stated that Robert Downey Jr. would be joining the third installment, and that the story would be based on the 2006 crossover Civil War. In typical Marvel fashion, the House of Ideas stayed mum on the subject, but now they’re done giving us the silent treatment. 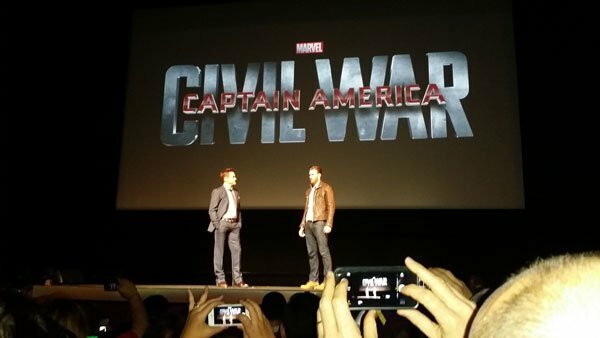 At today’s Marvel press event, they announced that the third Captain America movie will be called Captain America: Civil War. The original Civil War storyline saw the Superhuman Registration Act passed by the U.S. Congress, which required any individual with superhuman or unusual abilities to register with the government and disclose their secret identities. While Tony Stark took the pro-registration side, believing that with proper supervision more good could be done, Cap was anti-registration, believing that it infringed civil liberties. Both teams led their sides in multiple conflicts, and it ended with Cap surrendering himself after he realized the devastation they were causing. Soon after he was killed. While the movie won’t be able to adapt every aspect of the storyline (primarily due to not having the live-action rights to many characters), it looks like Tony Stark and Steve Roger will find themselves on opposite sides when 2016 rolls around. Rivaling the announcement of the title itself was the reveal that Black Panther will appear in the movie played by Chadwick Boseman. Black Panther has been a character that fans have been waiting to see in the MCU for a long time, and while many believe that his home country Wakanda will be seen in Avengers: Age of Ultron, this will be his live-action debut, followed by his own movie in 2017. His role in the movie is unclear, but with the MCU becoming more global, he’ll likely be a crucial player in the conflict. I could see Wakanda perhaps becoming a safe haven for superhumans that don’t want to register with the U.S. government. It’s unclear what’s going to lead to something akin to the Superhuman Registration Act being passed in the MCU, but chances are it will have to do with the fallout from Avengers: Age of Ultron. After defeating Ultron and suffering losses, Tony may decide that superheroes can’t keep at this on their own anymore. They need political support to reach their maximum potential, which means that anyone with superhuman abilities needs to register immediately. The problem is that there aren’t nearly as many superhumans in the MCU as there are in the comics, and even fewer with secret identities, so the scale of this conflict will have to be toned down. Regardless, it will be interesting to see the ideological battle that unfolds between Tony and Steve, two people who have been allies for years, but now finds themselves at odds with each other. Depending on how things go, there may be a chance that we also get cameos from other Marvel superheroes, although Iron Man and Captain America are obviously the focus. The title also suggests how things might end for Cap. Although Civil War ended with him being arrested, he was soon assassinated in his own book at the orders of his arch-nemesis the Red Skull. Cap being outright killed is unlikely considering that Chris Evans is contracted for one more movie after this, which will probably be on Avengers: Infinity War movies. Perhaps Cap decides to retire the shield and go into hiding, only to come back in one of the Avengers films to help out his old teammates, and maybe then it where he’ll die a heroic death. However, if Marvel decides to reduce Evans’ role in one of these movies to simply a flashback or hallucination, we may in fact see Cap meet his end in 2016. It’s hard to believe a solo Marvel movie having more of a status quo impact than Captain America: The Winter Soldier, but going off what we know, it sounds like Captain America: Civil War is being set up as one of the most important movies Marvel has ever made.